Good morning to all my friends and fellow bloggers. If you found your way here by chance you are very welcome and I would love it if you left a comment to say that you have visited. 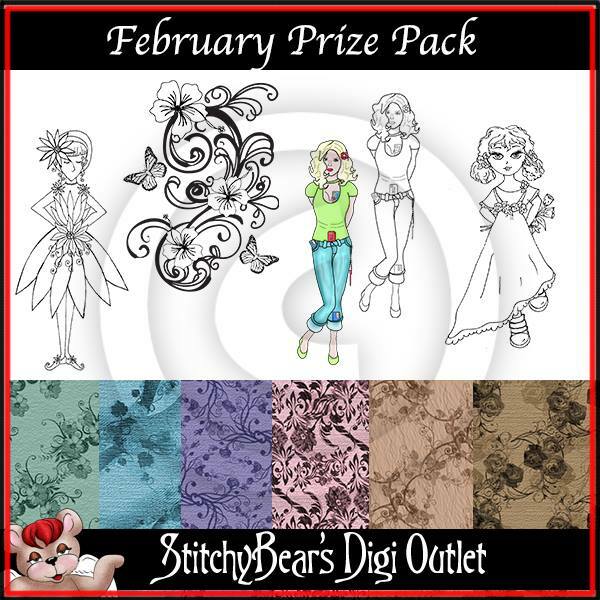 Today is challenge #256 at OSAAT and for my card today I am using the image Shy Girl from Barbara Jenson which you can find here in the store. For some reason, and totally unwittingly, my cards all seem to be turning out to be monochrome. This was no different, but at the last minute I realised and added some lavender with promarkers. 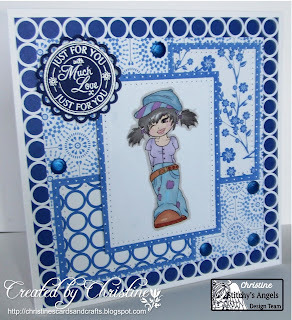 I stamped the sentiment with Versamark and then used WOW Bright White embossing powder. If you would like to join us in our challenge, and it's coming up to St Valentines's Day so I'm sure you can find something to fit the bill, this is what you could win. Brilliant card Christine, love the fantastic design and the image. You made a fab blue card Christine! I like what you've done with the different papers. A very pretty card, such a cute image. what a brilliant card, and very lovely design too. Love all the blue, and your fab image as well. Great papers used and such a very lovely sentiment stamp. Great image and papers. Your monochrome always looks very classy.